Bologna Airport, receives the name of one of the most illustrious Bolognese, the winner of the Nobel Award Guillermo Marconi. The architectural studio of Marco Colonnelli thought on the compact mineral from Porcelanosa Group, to make the stands, thanks to KRION® properties, its use on high traffic areas is becoming one of the most popular sectors. Really easy to clean, seamless, and antibacterial properties without additives, makes KRION® an ideal material for transport sector. 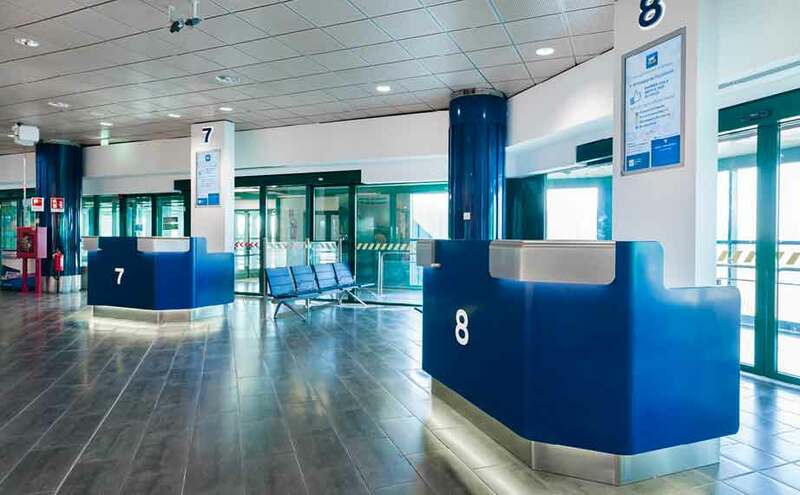 Fusion between colors 1100 Snow White and 1704 Navy Blue, has provided the area on the checking area with a single allure that makes it unique and different from any other airports.